I am on an endless mission to find the perfect foundation. What is perfect? Oh you know, medium to full coverage (buildable), matches my skintone, doesn’t look cakey, doesn’t oxidize, lasts at least 8 hours, and mattifies my oily face. I don’t ask for a lot right? Revlon ColorStay in the oily/combination formulation has been the closest I have gotten to this goal. The problem is I can never find the right shade. My latest one is too dark because I bought it during the summer when I had a “tan”. And it oxidizes. I look like I got an orange spray tan. Recently I went searching and swatching and came across Tarte’s Amazonian Clay 12hr Foundation. The $38 dollar tag versus my trusty ColorStay’s $9.99 kept me away, but around the same time Sephora sent a $15 gift card to Beauty Insiders. This was destiny’s way of telling me it was time. If we were playing bingo with my opening paragraph, well, BINGO! Off to Sephora I go! After some awesome help from the girl working there, we picked up Light Medium. I probably should have gotten medium since this has pink undertones but I can make it work. This foundation comes in 8 shades. Packaging is a brown squeeze tube with a hella cute “wood” cap wide enough to stand. You don’t have to touch the product or waste any by pouring. Just squeeze a bit and go. Yay for good packaging! So does it live up to those claims? Well, at least on my face. I love the consistency of the product. It’s mousse-like? Whipped? Not sure, but it’s not a straight up liquid. It’s creamy but not thick. I use my Real Techniques buffing brush to do an all over “base”. On a low maintenance day, this would be enough. But if I’m looking for FULL coverage, I’ll put a little on the back of my hand and use the Real Techniques foundation brush to “paint” it on the problem areas, mainly my acne (learned this from the awesome Lisa Eldridge). Lastly I’ll use concealer on spots, right now the Sonia Kashuk Hidden Agenda is my fave. A little powder to set it, and done! I don’t need to set it too much since it’s already long lasting and mattifying. After seven-ish hours it starts to fade around the bottom half of my face, around my mouth and over the acne. Not too bad if you ask me. I also feel that since I stopped using ColorStay, my face has started to clear up a little. My pores don’t feel bogged down and clogged. I don’t have super active cystic acne right now. 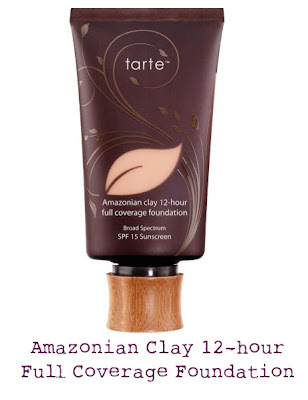 I’m thinking the Amazonian Clay in the Tarte foundation is doing some kind of pore cleaning. All in all, I love this foundation and I’m excited to keep using it.